Motor Trend praised the 6th Generation Camaro for its World-Class sports car performance, design, and value. 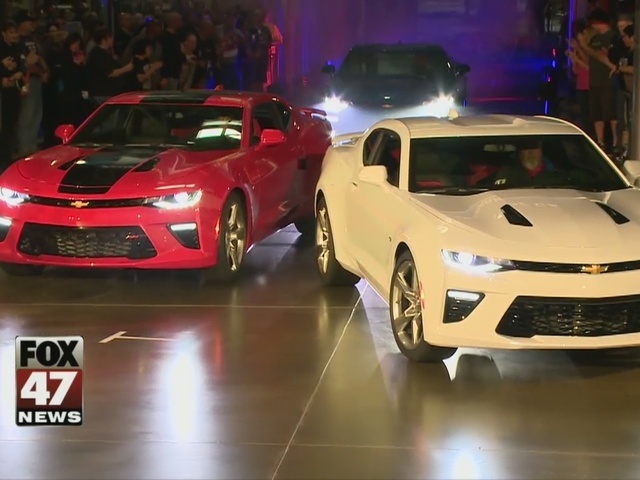 "The 5th Generation was the best-selling sports car in America for five years, so this one had to build upon that," said Lansing Regional Plant Manager Michael Trevorrow. "I think this is starting to show evidence that we hit a home run with it." That excitement can build up to more demand. "So now for us it's going to be increased sales potential right?" said Trevorrow. "This is going to be more and more consumers want to get their vehicles, which is good news for us to build them." Right now plant workers are building all the pre-ordered cars, and by the end of the month all the dealerships will have a 2016 Camaro on their lot. "The number one thing is getting one car here," said Shaheen Chevrolet General Manager Jason Cords. "So people can come out, touch it, feel it." He says people personalize their Camaro more than any other type of car on the lot. "It's a wide range of people," said Cords. "It's from the 16-year-old kid that's dreaming about such a fabulous car up to even 60, 70, 80-year-old people out here looking at this car because it's something they dreamed about." While most dealerships have 3-4 on the lot, Shaheen Chevrolet is looking at stocking 20 to 25 Camaros. "It is exciting for us," said Cords. "We will do an unveiling." Putting the new car right in its showroom. "We've got specialty cars, but we always have a Camaro in," said Cords. The dealership has already made room for the new car to roll in.